Convicted criminal James Griffin-Mars is no one’s hero. In his time, Earth is a toxic, abandoned world and humans have fled into the outer solar system to survive, eking out a fragile, doomed existence among the other planets and their moons. Those responsible for delaying humanity’s demise believe time travel holds the key, and they have identified James, troubled though he is, as one of a select and expendable few ideally suited for the most dangerous job in history. James is a chronman, undertaking missions into Earth’s past to recover resources and treasure without altering the timeline. The laws governing use of time travel are absolute; break any one of them and, one way or another, your life is over. Most chronmen never reach old age; the stress of each jump through time, compounded by the risk to themselves and to the future, means that many chronmen rapidly reach their breaking point, and James Griffin-Mars is nearing his. Note: I received an ARC of this book from tor.com. This has in no way affected my review. It’s awesome, period. Time travel stories are hard to get right. Wesley Chu got it right. 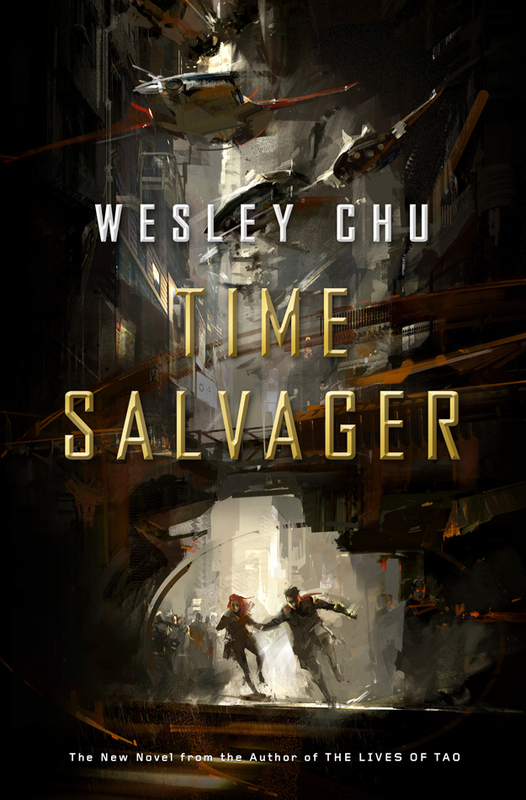 Time Salvager is Wesley’s fourth novel, but the first one I’ve read. It makes me want to go back and read his other books—it really was amazing, right from the first page. It has one of those first chapters that really hooks you and draws you in. I dare you to read it and not want to immediately read the rest of the book. Time Salvager uses the concept of time travel in a way I’ve not seen it used before. The people of the far future, when humanity has run itself out of resources, are desperate for more. They send people back into the past with the sole goal of stealing energy sources and other resources from history, while causing minimal impact on the time stream. This is the “salvage” part of the concept, and it adds a really interesting twist combining a post-apocalyptic future and a time travel adventure. For adventure it is. While I love a book that can immediately make me want to pick it up for the cover (Richard Anderson! ), or just the concept—the above paragraph would probably be enough to sell me a copy of this one—I also like a good plot. The plot here is not too convoluted, and that, for me, made the book even more enjoyable. It’s a straight-forward, fall in love, break the rules, and maybe accidentally save the world while you’re at it adventure story. The pacing is brilliant, and it has just the right amount of hinting at an even bigger conspiracy going on behind the scenes that make me want to buy and devour the other two books of this trilogy as soon as they come out. In addition to the really cool use of time-travel, Chu has done some in-depth world-building that makes the book really enjoyable. The last names, for example, are a subtle, brilliant touch that just makes the book feel even more real and awesome. There’s also a number of cameos of people I recognize from the Twitter community. I spotted 5 of these, and it’s fairly likely I missed some others, but since they’re all subtle and handled well, they never distract from the real storyline. The characters are marvelous. James, our viewpoint character, is a downtrodden man who has been through too much, saved too many items from ships being wrecked or buildings about to be destroyed in wars. He has a massive drinking problem, and the nightmares to go with it. He’s the perfect beaten-down nobody. His counterpart, Elise is just the opposite. Optimistic, cheerful, and overloaded with brains, she balances out his bleak attitude, and brings a ray of hope to the dismal future. I loved their interactions, and the way that Chu worked them together. Perhaps my only complaint with the book, minor though it is, was the ending. It wasn’t terribly satisfying, and felt more like the cliffhanger ending you would usually see on the second book of a trilogy rather than the first. It still was quite exciting, though, so it didn’t ruin the experience for me. In exciting news, the book has already been optioned as a movie, and I am mostly excited to see how it will turn out. I think it will make a great movie that fits well, thematically and action-wise, with many of the various other dystopian movies that have been released recently, and I expect that it’ll be a hit with the crowds. As long as they keep the story intact, it’ll be awesome, and I am certainly getting tickets to see it as soon as it comes out. In summary, Time Salvager is a time-traveling adventure dystopian mashup that is brilliantly done and well paced. I loved my first taste of Wesley Chu’s writing, wish him the best of luck with this year’s Campbell Award, and am looking forward to seeing the movie—and since I’m giving this book five of five stars, you totally need to read it before said movie comes out! This book has been on my TBR and I’m even more excited to read it after this review 🙂 Great review!